A quick card for the Inspiration Challenge going on over at Splitcoast today. Anne led us to the Magpie site, full of wonderful inspiration. Really simple card today. 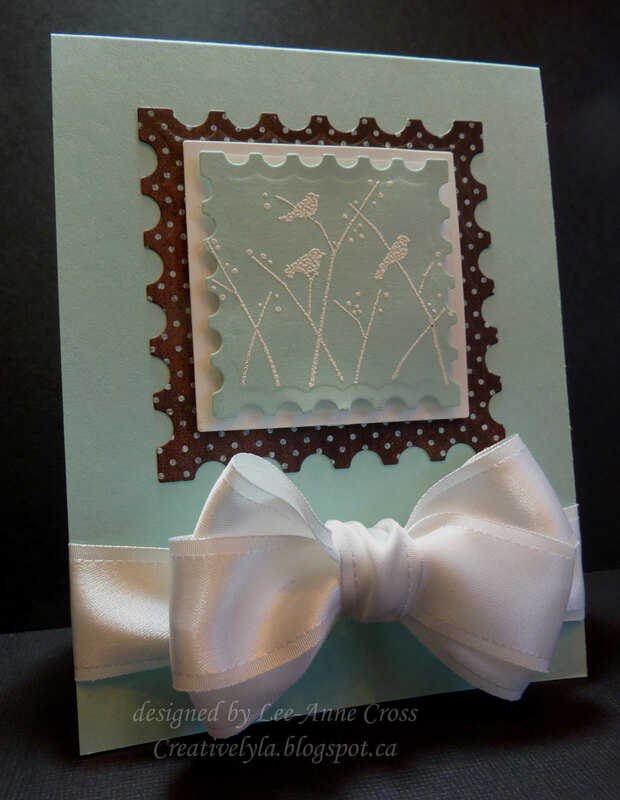 Stamped and heat embossed the bird image in white, then die cut it. Added a regular square nestie die cut behind it and then another postage stamp die cut behind that. The top two layers have dimensionals behind them. Added a white satin bow/ribbon and done! Sometimes it’s nice to have cards around with no particular sentiment…that way it’s good for a birthday, anniversary or sympathy card. Paper: SU! Pool Party, SU! Whisper White and unknown left over???? Thanks for being with me today, my friends! Back soon with more!